Pauline Kalioujny writes and illustrates children’s books. 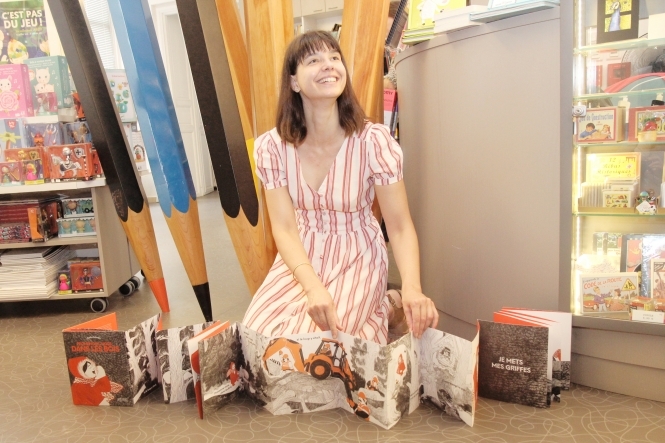 She has won two awards in 2018 for her book Promenons Nous Dans Les Bois – the Prix Pitchou at the Fête du Livre de Jeunesse at Saint-Paul-Trois-Châteaux, Drôme, and the Grand Prix de l’Illustration awarded at the Museum of Children’s Illustrations at Moulins, Alliers. She is an established author/illustrator and publishes books regularly. Baba Yaga came out in October, and she has another book due for release for the Spring. However, as she explained, it is a long road from loving to draw as a child to having a book published with your name on the cover. What attracted you to writing and illustrating? All children love drawing and being imaginative but most stop when they are older. Artists like me, decide they will not stop being like that. I grew up in a family where my mother and grandmother were both interested in children’s literature and we had a house full of books.